Boy: It’s a giraffe with a really colourful pattern on its neck. 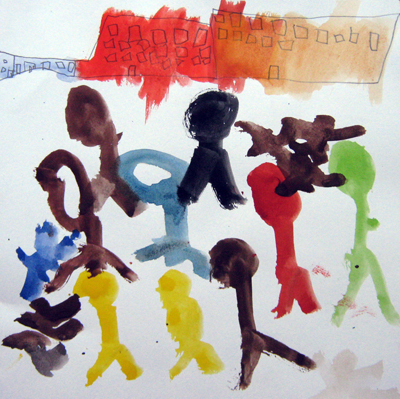 Boy: That’s our school and that’s all the children in front – in different colours, because we’re all different. D: Hedgehogs are spiky and they roll up into balls. Me: Yes, when they’re scared, or when they’re sleeping. D: Or when they see a shadow and think it’s a dinosaur. Me: They wouldn’t see any dinosaurs – there aren’t any dinosaurs now, they’re extinct – they all died a long time ago. D: Why did they all die? Me: Because the weather changed and they couldn’t find any more food. Me: No, it was icy – and they couldn’t find any food in the ice. D: Oh… Mum, do bats live now? D: Well I never see any! Me: That’s because they sleep in the day and come out to play at night. D: Why do they come out at night and not in the morning? Me: Because – you know how they can’t see? – Well it’s quieter at night, so they can hear more.